On May 21, at Makishi Public Market in Naha, the head of the Yonner Food, Kazumi Kayo, explained the best way to eat Okinawan fish. Yonner Food, a cooking school in Naha, has set up a cooking experience course as a new type of tour in which participants buy the required ingredients at the Makishi Public Market in Naha and then make Ryukyuan cuisine at the cooking school. The tour is designed so tourists can experience the Okinawan way of life through Ryukyuan cuisine and culture, and the initial response from travel companies is favorable. It will be included as a formal course in time for this summer season. The school offers three courses: court cuisine, home-style meals and confectioneries. Before the cooking practical experience, participants purchase the required ingredients at the market, fish merchants, vegetable stores and butchers who are familiar to Kazumi Kayo, the head of the school. Talking with local merchants is also an enjoyable experience for the tourists. In the cooking class, participants from outside of Okinawa asked Kayo about the names and the nutritional effects of Okinawan vegetables. The cooking experience course commenced with Kayo taking the participants on a tour of the market. They were pleased that they could enjoy the market in a slightly different way from when they visited it by themselves. The course is between three and a half to four hours long, including about 30 minutes of shopping at the market, one hour and a half to two hours cooking, and 30 to 40 minutes of food tasting time. The course for home-style cooking is offered in groups of six people, with the tuition fee being 6000 yen per person, including ingredients, insurance and transportation. The Okinawa Industry Promotion Public Corporation is supporting the tour in the expectation that it has potential as a prefectural sightseeing offering. 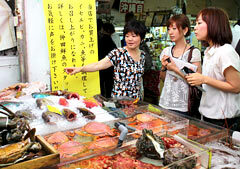 Kayo said, “Tourists enjoy talking with local people in the market. They also buy local vegetables as souvenirs when they leave Okinawa.” A fitting of Ryukyu Dynasty traditional costume will be offered as an optional extra. She also plans to open an outside cooking class in the vicinity of the market. For further details call Yonner Food at 098-832-7747.